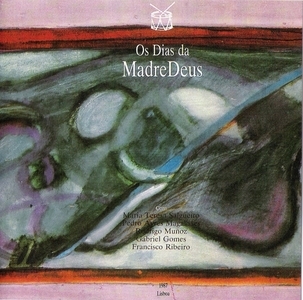 ◊ Os Dias da Madredeus, Madredeus’ debut album on the Portuguese market, offered for the first time the group’s appealing and remarkable compositions. The record exposed the sole musical mission of the Portuguese ensemble. Providing sole compositions, Madredeus settled their musical course in between the original Portuguese fado and influences ranging from Brazilian music to classical musical inflections. Leaded by the voice of Teresa Salgueiro and by the delicate and melodious creations of Pedro Ayres Magalhães, Gabriel Gomes, and Rodrigo Leão, the ensemble started gaining their legion of followers precisely after the record originally hit the record stores in 1987. “A Vaca de Fogo,” the record’s third track, swiftly became the group’s most recognizable theme due to its joyful rhythmic features and exclusive arrangements. Still, the whole of the work expressed through the album mostly reveals Madredeus' nostalgic musical endeavors, strengthened by way of their gloomy musical direction and enlightened by the sorrow and hurtful lyrics unveiled by Salgueiro’s unique vocalizations. “Fado do Mindelo,” “Maldito Dia Aziago,” and “Amanhã” are just three of the album’s most noted tracks, again sustaining the unique character of Madredeus’ conceptions, initiating a musical path that eventually conquered fans all over the world.